September 2012 Friday 31st August to 3rd September: Budget Tour to Douro Valley including picturesque train journey to the heart of the Douro Valley. 3 nights £590.00 per person based on two people sharing. It does not include travel to/from Portugal but does include all travel within Portugal, all hotels, meals and organised visits and trips – wineries, boat trips and river cruises. Optional extra night hotel on Thursday 30th August, inc. dinner for additional £50 per person. Bookings for this year’s Douro Valley Budget Tour are now CLOSED. However, we shall offer this again next year – details of which will be posted in our web pages in January – so do add a note to your calendar to visit www.winesandtours.co.uk during mid January 2013. September 2012 Monday 7th September to 14th September: Luxury Douro Valley Tour, staying at splendid 5 star Yeatman Hotel on first night with dinner on the river. Inclusive of the Yeatman Hotel, rooms at the Quinta da Pacheca and the Quinta San Antonio are currently held unconfirmed pending firm bookings. Due to the wine harvest, September is an extremely busy period in the Douro Valley – so unpaid reserves for rooms held without a deposit, are now very limited and therefore early booking is essential. So if we have too many late deciders we may need to change our chosen hotels. The Cost of the tour is £1690.00 per person based on two people sharing. It does not include travel to/from Portugal but does include all travel within Portugal, all hotels, meals and organised visits and trips – wineries, boat trips and river cruises. Bookings for this year’s Douro Valley Luxury Tour is now CLOSED. However, we shall offer this again next year – details of which will be posted in our web pages in January – so do add a note to your calendar to visit www.winesandtours.co.uk during mid January 2013. September 2012 22nd -23rd Visit to England’s Sharpham vineyard in Devon: Overnight stay at Durant Arms Hotel Ashprington. Wine and Food Pairing Dinner in the evening. Visit to Cheese maker during following morning followed by visit to Yearlstone Vineyard, Bickleigh. Cost £250 per person based on two people sharing. Bookings for this year’s wine tour in Devon to Sharpham and Yearlstone vineyards is now CLOSED. 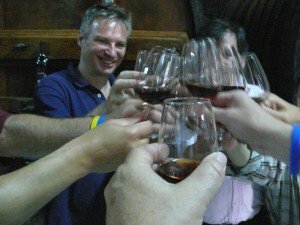 However, we shall offer this again next year and/or another UK vineyard tour – details of which will be posted in our web pages in January – so do add a note to your calendar to visit www.winesandtours.co.uk during mid January 2013. October or November 2012 Golf and Wine holiday in Cyprus: Four different Golf courses, 3 wineries, some site-seeing. Estimated cost less than a £1000 including flights, hotels, meals, winery and other visits. Prices and details to be advised.